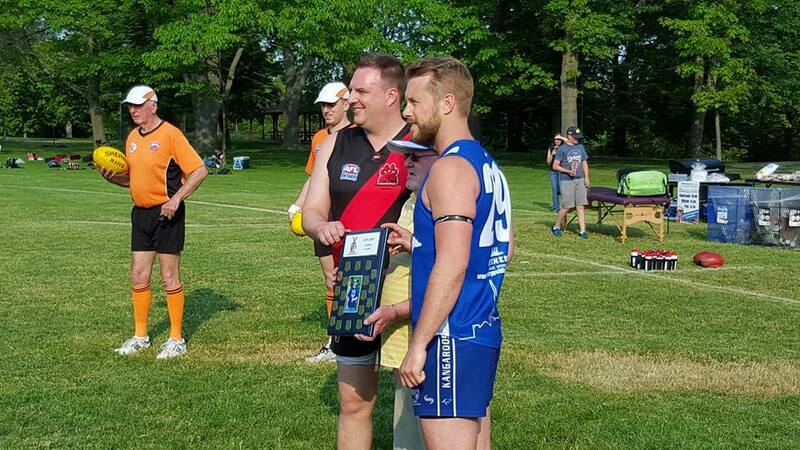 The Toronto Dingos Div 1 team headed down to Humber South this past Friday night to do battle with the defending champions Etobicoke Kangaroos. With the 'Roos having defeated the Dingos' in the Preliminary Finals last year and this being Chris Buczkowski's 200th match for the club, the boys in Red & Black had extra motivation to bring home the win. As well, this match marked the second season of the Ken Gray Memorial Cup, honouring a 'Roos supporter who passed away. Unfortunately, the Dingos were not going to find much success on the field this day. With 7 Dingos overseas for Gazza's wedding and a number of other regulars unavailable, the Dingos could only muster 17 bodies on the night, including a number of first-gamers. Hats off to the 'Roos who agreed to play 16 v 16, despite a full bench. The Dingos started off well. A quick win out of the middle saw the ball marked by centre-half forward Wellsy, who hit Tinks on a lead, who hit Noddy. Noddy put it through for a major score and the Dingos looked good. But soon after the 'Roos began to assert themselves, winning the ball out of the middle and hitting their big target Chipper up front. Despite some good runs of play, the Dingos allowed too many free balls into their backline and the 'Roos capitalized, putting up 5 goals in the first quarter. Much of the match followed a similar script, with the 'Roos putting up multiple scores each quarter. Backmen Mike Karas and Bocian were under siege all game, trying to shut down Chipper and Emile. In the middle, Ruckman Rob Eckford did well, as did Steve, Bossey, and Laddy trying to get the footy forward. Big Butch in his 200th match presented well up front, but had few opportunities. One highlight for the Dingos was new Irishman Stephen Donnelly, who kicked the first two goals of his career and did well working off the forward-flank and up and down the wing. 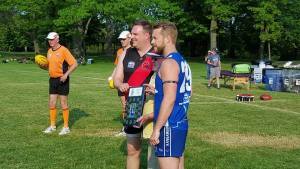 In the end, the Dingos were thumped 21.14.140 to 5.2.32 and will look to bounce back next week in Guelph against the Gargoyles. BOG went to Wellsy, who ran hard all day presenting a target from the centre-halfforward position. Congrats to first-gamers Donno, Greg Gilbert, and Daniel Marino. And big congrats to Chris Buczkowki on his 200th. Maybe we'll have better luck on his 201st.